So, have the three people who haven’t seen The Last Jedi gone? Good. Now, then: Rey’s parents. What was the deal with that? According to Kylo Ren, they were nobodies, anonymous junk traders who sold her for drinking money, and Rey confirms, deep down, she always knew this. After everything that happened in Star Wars: The Force Awakens, how did Rian Johnson get to the point where that was the answer? “I was thinking, what’s the most powerful answer to that question? Powerful meaning: what’s the hardest thing that Rey could hear? That’s what you’re after with challenging your characters,” Johnson reveals to EW. No Obi-Wan connection. No Skywalker parentage. Just a plain ol’ nobody from nowhere becoming a Jedi. In many ways, it works. 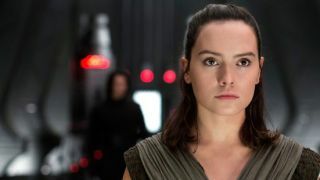 For all of the complains – rightly or wrongly – people have with the movie, Rey’s parent reveal was one of the most well-handled moments, complete with real growth for Rey. So, after all is said and done, some fans might just get their wish and have Rey be fathered by the Force and Admiral Holdo, or some other ridiculous mumbo-jumbo. Rian Johnson did warn you, though.